The following is a list of the shortest women tennis players that I am aware of and have been able to find. If anybody knows of a shorter women's tennis player, please leave a comment. In general, women tennis players tend to be much taller than the average woman. The average height of a woman in the United States is 5' 4" tall. As you can see from the list below there have not been that many women tennis players much below the average height. Who is the greatest shortest women's tennis player of all-time? Both Billie Jean King and Maureen Connolly are/were 5' 5" tall, but the greatest shortest player has to be Chris Evert who is 5' 6" tall. Listed below are all the women tennis players in the modern era who are 5' 4" or shorter. Cynthia Gem Hoahing, also known as C.G. Hoahing and Gem Gem Hoahing, stood just 4' 9" tall and she played women's tennis in the 1930s thru 50s, playing at Wimbledon from 1937 to 1961. Her biggest win at Wimbledon was in 1949 over Gussie Moran to reach the 4th round. She last played singles at Wimbledon in 1957, where she lost to eventual champion Althea Gibson also in the 4th round. Gem Gem Hoahing was born in Hong Kong in 1920 or 1921. Her parents were of Chinese descent who emigrated to British Guyana where her father was a successful businessman and her mom was a doctor who was educated in Edinburgh, Scotland and Dublin, Ireland. The shortest women's tennis player of all-time in the modern era is Nuria Llagostera Vives from Spain who is 5' 1" tall. Nuria turned pro in 1996 and she retired from the game in 2013. Nuria Llagostera Vives was a pretty good player. She won two WTA singles titles and 16 WTA doubles titles in her career and earned $2.64 million in prize money. The farthest she went in singles in Grand Slam events is the 4th round at the French Open. In doubles, Nuria reached the quarters at all four Grand Slam events and made the semifinals three times. In 2013, NuriaLlagostera Vives was banned for two years for testing positive for methamphetamine. Nuria was 33 years old at the time and she immediately retired from the game. You wonder if her height had anything to do with taking the meth in order to compete but she was also 33 years old and that probably was the bigger factor in her drug use. Lauren Davis is a very active American tennis player who stands just 5' 2" tall. So far in her career, Lauren Davis has won one WTA singles title (2017 ASB Classic) and has career earnings of $2.2 million. That farthest Lauren has gone at the Grand Slam events is the 3rd round at both Wimbledon and the Australian Open. With quite the appropriate name, Anna Smashnova is a retired (2007) Russian-born tennis player who represented Israel internationally. Anna was a pretty good player, winning 12 WTA singles titles and she has career earnings of $2.3 million. The farthest she went in Grand Slam events is the 4th round at the French Open in singles play. South African Amanda Coetzer played tennis professionally from 1988 to 2004. She was a very good player winning 9 WTA singles and 9 WTA doubles titles and earning $5.6 million on the court. Amanda Coetzer made three semifinal appearances in Grand Slam events in singles play and made the U.S. Open final in doubles play in 1993. Dominika Cibulkova is a very active women's tennis player from Slovakia who stands 5' 3" tall. Dominika has won 8 WTA singles and one WTA doubles titles so far in her career and earned $12 million on the court. Dominika Cibulkova made the Australian Open final in singles play in 2014 for her farthest Grand Slam showing to date. Jill Craybas is a retired American tennis player who played on the WTA circuit from 1996 to 2013. Jill won one WTA singles and 5 WTA doubles titles and her career earnings are $2.6 million. Jill Craybas made the 4th round at Wimbledon in 2005 in singles play and the quarters at the French Open in 2004 in doubles for her best Grand Slam showings. Spain's Carla Suarez Navarro is an active tennis player who has made the quarters five times in Grand slam events in singles so far in her career. 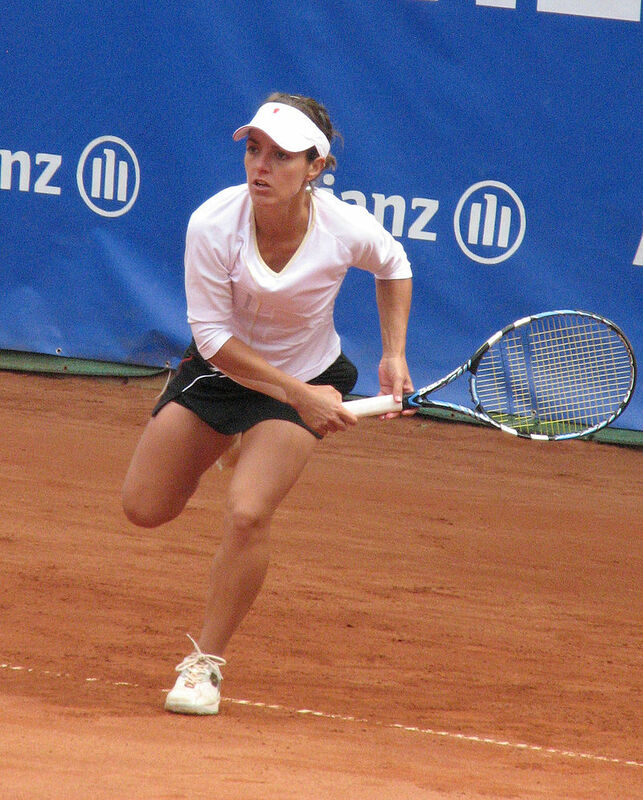 Carla has won two WTA singles titles and has career earnings of $9.2 million. T-8. Vania King - 5' 4"
Vania King is an active American women's tennis player who won Grand Slam doubles titles at both Wimbledon and the U.S. Open in 2010. Vania has won one WTA singles titles and 15 WTA doubles titles so far in her career and her earnings stand at $4.1 million.